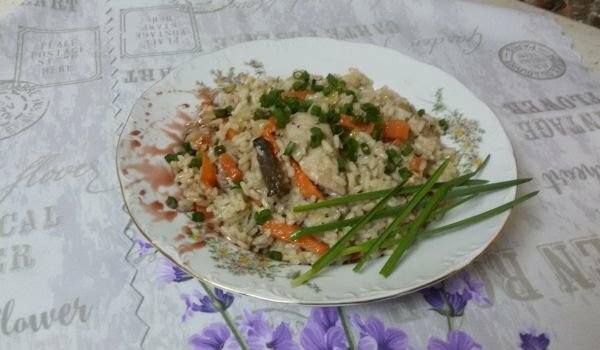 Broiled rice with chicken and vegetables in Chinese, light, easy to prepare and delicious – so we will describe the perfect spring meal. Chinese cabbage – 1/4 pcs. Cut the chicken meat of juliens and flavor with marinade of salt, pepper, lemon juice and soy sauce. Leave for an hour in the refrigerator. During this time, cook the milled rice in boiling salted water in a ratio of 1: 2. Drop into the water a pinch of nutmeg. 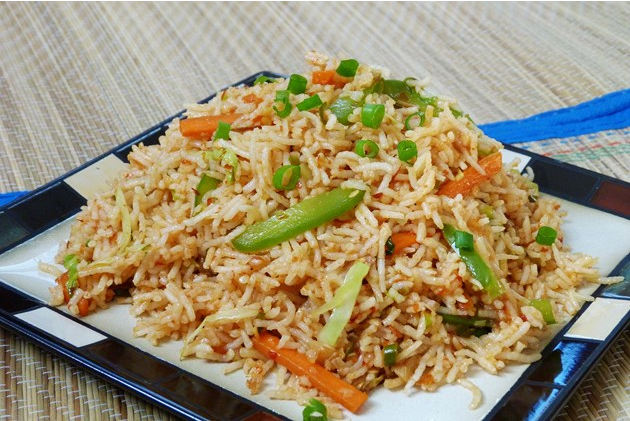 Cook the rice for 10 minutes, stirring occasionally, then top up and let the rice take up all the water. Prepare the vegetables by peeling the zucchini and carrots with a peeler and chopping up sticks, bigger cubes onions, Chinese cabbage and strips, garlic and peanuts. Dip the meat into shredded protein and fry with olive oil in a suitable deep or wok pan. Remove the meat, drain and place in a clay pot to keep its heat. In the same pan, fry the carrots, zucchini, garlic, cabbage, pepper, mushrooms, and onion in succession. Do not fry the vegetables – they should be slightly crunchy! Make them with soy sauce. Add the rice, meat and stir until all products are mixed for a few minutes. Pour the white wine and mix again. Remove the finished dish from the hot plate and pepper with pepper. Serve with wild garlic and fresh onions, and for lovers of sweet and sour and more spicy meals fill with pomegranate sauce Good Appetite!